Tammy is pictured at far right. 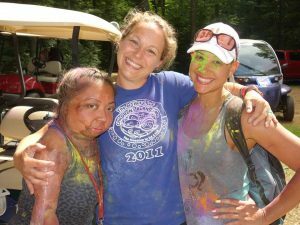 Being able to volunteer as a counselor for the burn camp that had given me so much as a kid was an amazing experience. The confidence I have is in large part due to the experience I had at camp. So this year, I am participating in AngelRide to benefit the Arthur C. Luf Children’s Burn Camp. The cost to send ONE kid to camp is about $2500. All kids attend at no cost to their families and all the staff are volunteers. Come out to support this event to help send these awesome kids to camp. I’ll be biking 69 miles on June 1st. My goal is to raise $1991. 1991 is the year I was in a gas leak explosion. Both my brother and I suffered first, second, and third degree burns and I lost my father. It is also the year I attended Burn Camp as one of the very first campers. I’ll be back to volunteer at Camp again this year because it means a lot to me to play a role in developing the self-esteem of young burn survivors and helping them to have the greatest experience – just being a kid at camp.